The Toronto Maple Leafs are a serious contender this season, a fact which has dramatically altered the organization’s approach ahead of the 2018 NHL Trade Deadline. Known as a definitive seller for the better part of the last decade, the Leafs have finally established themselves as a legitimate threat in the Eastern Conference. 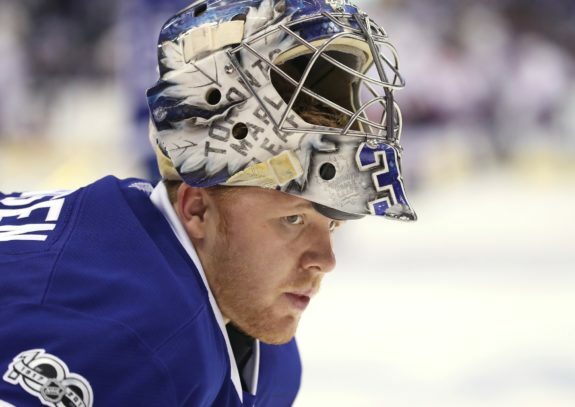 Vehemently interested in improving their odds of capturing the Stanley Cup, the Leafs will be looking to add multiple assets prior to the trade deadline who could help elevate their team to the next level in this season and beyond. Although Toronto would surely like to add numerous pieces to their lineup, contractual and financial constraints will restrict the Leafs to a select few moves, if any at all. Further, given Toronto’s salary cap situation, only particular players will be available to the team pending other unforeseen additions or subtractions. So, with this being said, who can the Leafs legitimately target at the trade deadline? Here are the five most likely, and most significant, options for the budding franchise to consider. 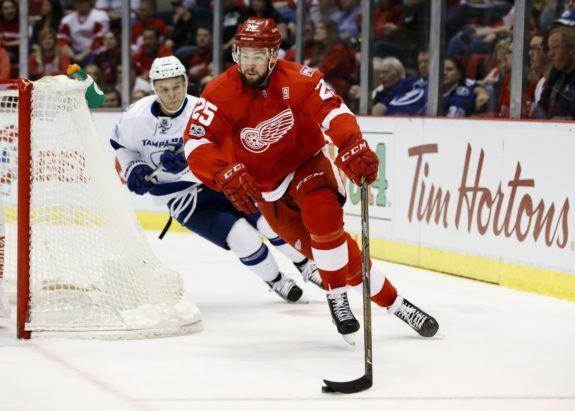 Mike Green is a veteran offensive defenceman in the midst of his 13th NHL campaign. Having played in well over 800 career regular season and playoff games for the Washington Capitals and Detroit Red Wings, the native of Calgary, Alberta knows exactly what it takes to win at the NHL-level on a consistent basis. However, as a pending UFA and a highly valuable one at that, Green could find himself on the move ahead of the looming trade deadline. In search of a veteran defender of ample skill, the Leafs could be the ideal suitor for Green, who continues to find himself in search of his first Stanley Cup championship. As a terrific skater, acquiring Green would bode well for Toronto and their transition game. Capable of skating the puck out of danger before generating a legitimate scoring opportunity, Green is a solid two-way player well-known for his 200-foot game. Further, boasting innate offensive instincts, Green could become an immediate fixture on the Leafs’ power-play, as the veteran’s quick release and ability to move the puck would undoubtedly improve Toronto’s mediocre play with a man-advantage. In terms of formulating a deal for Green, it goes without saying that the Red Wings would have to retain a portion of Green’s salary. Earning $6 million this season, taking on Green’s entire contract would create a financial conundrum for the Leafs, who already stand close to the cap ceiling. Lastly, with regards to a potential return for the dynamic defender, Toronto would certainly be asked to part with a mid-round pick and potentially a quality prospect as well. Mike Green said he’s talked to Holland about possible trade, said he’s open minded. Averaging well over 22:00 of ice time per game this season, nabbing Green would add instant depth to the Leafs’ blue line, which has been exposed by inexperience and injury at times this season. Dominic Moore has been solid throughout the 2017-18 season for the Leafs, providing a sporadic scoring touch and consistent face off success from his standing on the team’s fourth-line. However, despite Moore’s strong play, Toronto would do well to upgrade their depth down the middle of the ice heading into the postseason. 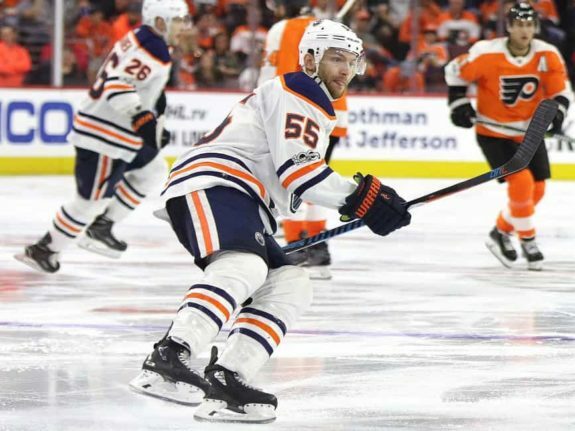 With their season being defined as nothing other than a complete failure, it has come time for the Edmonton Oilers to move on from a number of the pending UFAs, one of which being Letestu. Currently skating in the final year of his contract, Letestu carries a slender $1.8 million cap hit, a financial commitment which the Leafs could accept rather easily. As a powerful skater and driven individual, Letestu plays an energetic yet calculated game. Excellent in the face-off circle — more successful than Moore, in fact — Letestu is a player who drives puck possession and facilities strong zone exits with remarkable consistency. However, Letestu is much more than a terrific defensive player, as he netted 16 goals in 2016-17 and finds himself on pace to record a similar total this season. Heck, Letestu can even play on the power-play, as he boasts a blistering one-timer. What’s more is that he’s a proven playoff performer — he notched 11 points in 13 postseason contests last season. Now, when it comes to the Leafs and a potential deal involving Letestu, the asset(s) returned to Edmonton in exchange for his services could be as simple as a draft choice. 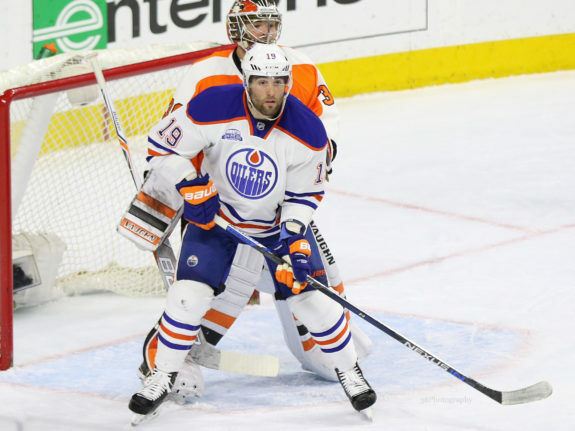 However, if Toronto aims to nab Patrick Maroon in the process, the return could very well involve a mid-level prospect in addition to a draft choice. As mentioned, it is only a matter of time before the Oilers begin to off-load their pending UFAs. And, if one of which was a lock to be traded, it is surely none other than Maroon, whose play has continued to out-perform his current contract. In the final season of a three-year deal worth $2 million annually, Maroon’s consistent offensive production and physical presence have, for quite some time now, far out-weighed his income. Sure to fetch a significant raise in his next contract, Maroon could prove to be an incredibly valuable rental player to an organization in need of both strength and scoring touch. Could that team be the Leafs? Quite possibly. Despite his love for Edmonton, Maroon could become a legitimate option if Toronto decides to trade James van Riemsdyk ahead of the trade deadline. A dominating presence in front of the net and a fixture on the power-play, Maroon could replace van Riemsdyk and, in the process, add grit and physicality to a Leafs team defined strictly by its speed and skill. Speed, however, is one quality which Maroon lacks — a deficiency which could complicate his potential presence in Toronto. As a team which generates its offence and scores off of the rush, Maroon’s lumbering legs could be his demise if acquired by the Leafs, as he likely wouldn’t be able to match the speed of Mitch Marner or William Nylander. The New York Rangers have made their direction as a franchise abundantly clear. Out of the mix in the Metropolitan Division owing to an abysmal record, the Rangers have decided to initiate a re-build and one which will focus strictly on the acquisition of elite young talent. With this being said, New York has set out to clear its roster of veteran players and pending UFAs, with none more valuable than team captain Ryan McDonagh. 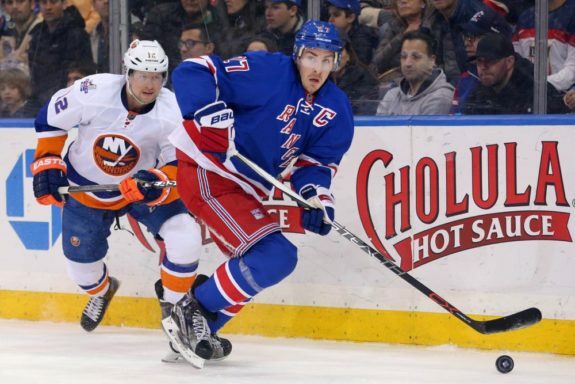 Under contract through the 2018-19 NHL season, McDonagh is a strong stay at home defender who prides himself on his defensive play. Standing 6-foot-1 and weighing in at 215-pounds, McDonagh is an intimidating defender who loves to punish opposing forwards en route to securing possession for his team. Further, the native of St. Paul, Minnesota is incredibly versatile, as he logs considerable ice time on both the power-play and penalty kill and is immensely successful in doing so. Fortunately for the Leafs, they could very well be in play for McDonagh’s services. As we have discussed in the past, Toronto needs to upgrade their blue line, as it stands relatively thin and devoid of considerable experience outside of Ron Hainsey. If the Leafs were to nab McDonagh, it would not only strengthen the team’s overall play this season but next campaign as well. Unfortunately, McDonagh’s contract status will complicate trade talks, as the final year remaining on his deal will force Toronto to pay a much stiffer price to acquire the defensive stalwart. With the Rangers in search of young talent and draft picks, the suddenly floundering organization would surely demand a first or second round pick from the Leafs in addition to a quality young player. While the names of Kasperi Kapanen and Andreas Johnsson will surely be discussed, the potential departure of either could be a massive risk for the Leafs given McDonagh could very well sign elsewhere following the 2018-19 season. Although the Vancouver Canucks are a team in search of a definitive direction and identity, it remains abundantly clear that the organization will not consider moving its most valuable players for anything other than a significant return. And, when it comes to defenceman Chris Tanev, such is exactly the case. With two years remaining on his current contract following the 2017-18 campaign, Tanev’s deal owns a $4.45 million annual cap hit alongside a modified no-trade clause which allows him to negate a deal to eight teams of his choice. 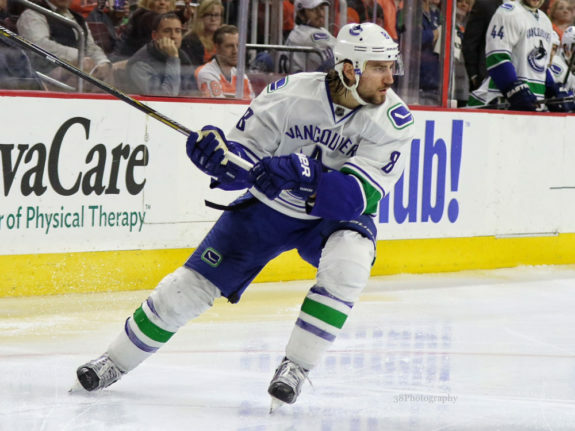 Further complicating matters is the fact that Tanev fell victim to a fractured leg just weeks ahead of the trade deadline — a substantial setback which will seriously impact the interest of potential suitors throughout the NHL. However, it is the existing term on Tanev’s contract which will surely garner the attention of numerous clubs, including the Leafs. As a minute-munching defender, Tanev loves to block shots and is a fixture on the penalty-kill. Willing to deny shooting lanes and capable of dismantling plays owing to his innate defensive instincts, Tanev is a legitimate top-5 defender whose size makes him an intimidating presence on the blue line. If acquired by Toronto, Tanev would surely find himself playing on the team’s third pairing. Although he would certainly be an expensive upgrade to the Leafs’ bottom-pairing, Tanev’s experience and proven penalty-killing abilities would be of immense value to Toronto as they prepare for multiple postseason runs in the immediate future. In terms of a return, the Canucks would likely eye one of the Leafs’ young defence prospects, as the likes of Andreas Borgman or Calle Rosén could help bolster an unstable Vancouver blue line.